A Romulan mining ship of enormous size threatens the planets of the federation. The cadets of the Starfleet academy with Commander Spock, one of their instructors, man the Enterprise a new spacecraft and set off to confront it. When the brash young cadet James T. Kirk and Spock come to blows, the young man is expelled to the surface of an ice world, where he meets an older Spock and learns the reason for the Romulan attack. With the help of an engineer , Scotty, he transports back to the Enterprise, takes over as captain and deals with the Romulans. Over the first half of the movie they get the band together, there are extended combats between the Romulans and the federation vessels. Some time back on earth showing the rebellious Kirk growing up, and then him at the Starfleet Academy. Time travel takes place for some and Kirk meets the older Spock on the ice planet. There is a bit of hand to hand combat, phasers are not set on stun so people die – mainly Romulans. A lot of combat and tension, some drinking and drunkeness, and Uhura strips off to her underwear. A View Oh, do come on! Could a young man who is actually a cadet be promoted to be captain of a new spacecraft? And if it comes to that why would Spock expel Kirk to the surface of a world on which he would be very lucky to survive. I was also a bit bewildered by the Romulan spacecraft which seems to be a vast wilderness of pointy bits. But other than that it was not too bad, and will light your fire if you are a Star Trek nerd. 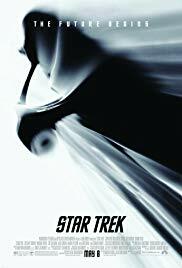 Source of story The whole Star Trek legacy – it is the 11th film. Additional Info I usually thumb through the IMDb trivia looking for the odd interesting item, but in this case there were 266 comments, so the volume of the trivia is interesting in itself.